Requirements: Windows Vista/7, DirectX 10, MSIE 7, MS Media Player 11. 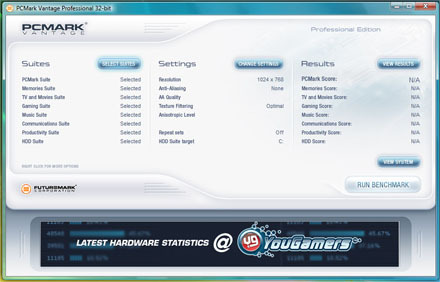 PCMark Vantage provides you with the correct tools for performance measurement of every type of Personal Computer with Microsoft's new Microsoft Windows Vista operating system from Office Productivity computers and Gaming Machines to PCs configured for the creative user. With an easy to use interface and clear scoring, you will be able to select exactly the type of tests you want to use and then choose the right upgrade components or complete PC that will fit your needs. This easy-to-use product gives you the same tools and knowledge that virtually every professional tester in the industry uses. PCMark Vantage comes in three versions: PCMark Vantage Basic, PCMark Vantage Advanced and PCMark Vantage Professional. Limited free trial version is available (without charge) to download (see the link below). PCMark Vantage 1.0 users can download a patch(15Mb), which will update the program to version 1.0.1.0 build 1901! PCMark05 1.1.0 users can download a patch(24Mb), which will update the program to version 1.2.0! PCMark05 1.0.1 users can download a patch(5.3Mb), which will update the program to version 1.1.0!